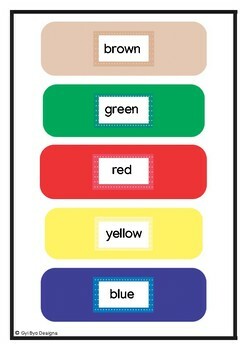 Children learn about body parts in a fun and creative way. A card is drawn from the top of a face down card stack and the student follows the instructions printed on the card. 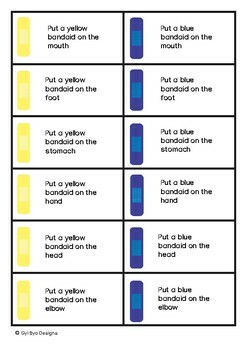 Each card specifies which particular coloured bandaid they should place onto a particular body part. 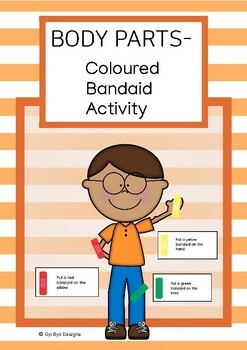 'BODY PARTS- COLOURED BANDAID ACTIVITY' is an 8 page pdf. 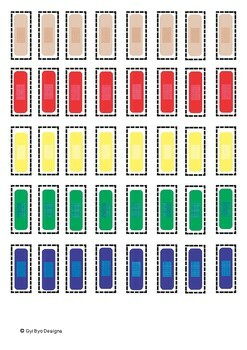 Gyi Bya Designs trusts that this product will be a blessing to your classroom/ home school and students. Gyi Bya Designs is committed to providing high quality, hands on learning materials for children in Myanmar and around the world. Please feel free to contact me at gyibyadesigns@gmail.com should you have any input, questions or suggestions.